"Medium sized sable with high wither and nice back. His foreass4embly is very good and he has very nice angulation. He floated around the ring with effortless suspension and with one of the best attitudes." "An exciting moving dog, good topline, clean coming and going, masculine, medium sized dog. A very, very fluid mover and in top condition. He could not take a wrong step. He has a slight tip in one ear. 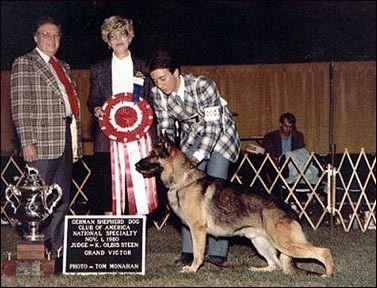 Sable in color, sound in ever way, always moved in a ground covering and machine like fashion, and would be considered a true working dog."